12.5" RCOS @ ~f/9 (2880 mm fl) at 0.64 arcsec/pixel. Shown at 0.86 arcsec/pixel. SBIG STL-11000 w/ FW8-STL filter wheel, AstroDon Gen II LRGB Filters. 2/25/2012 to 3/24/2012 Chino Valley, AZ... with CCDAutoPilot5 & CCDSoft. AOL guided. A standard image-train calibration was used, as determined by eXcalibrator v4.30, and then adjusted for altitude extinction. PixInsight processing includes registering and stacking the luminance, gradient repair, non-linear stretching with HistogramTransformation, HDRMultiscaleTransform and LRGB creation. The galaxy is shown rotated 45° clockwise. NGC 2523 is a barred spiral galaxy at a distance of about 155 million light-years towards the constellation Camelopardalis. Edward Swift discovered the galaxy in 1885. 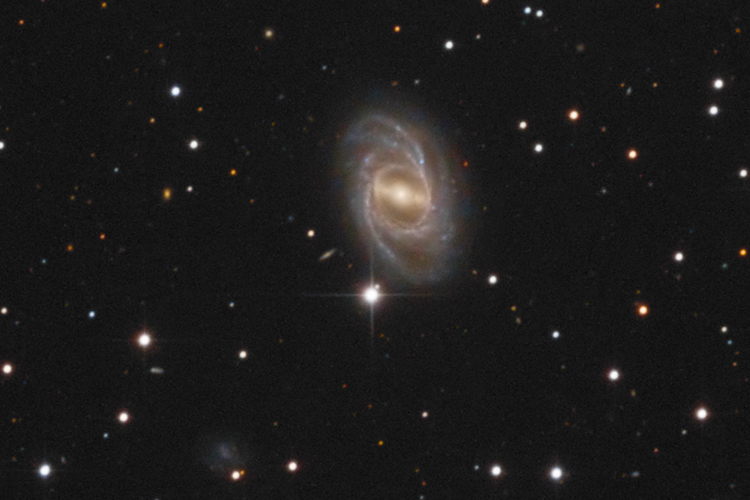 The galaxy is also item number 9 in the Arp catalog and is described as a spiral galaxy with split arms. One of the two main arms, that would form a grand design pattern, branches into two narrow arms. NGC 2523 also has a remarkably prominent inner ring that just encloses the 47 kly long bar.